Today I found out Steve Jobs’ first business was selling “blue boxes” that allowed users to get free phone service illegally. 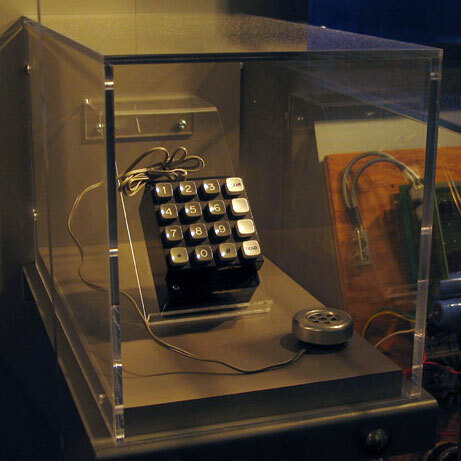 The blue box worked by producing certain tones that were used in the telephone system to switch long distance calls. Once you made a long distance call, you could use the box to enter operator mode, then use it to route your call as you wanted and to wherever you wanted, all for free and extremely difficult to trace, making blue boxes a popular item amongst various criminal elements. Experiences like that taught us the power of ideas. The power of understanding that if you could build this box, you could control 100’s of billions of dollars around the world, that’s a powerful thing. If we wouldn’t have made blue boxes, there would have been no Apple. The two stopped making the boxes after they were nearly caught by the police. Despite giving up on the venture, they reportedly made about $6000 selling the blue boxes and Wozniak claims he once was able to prank call the Pope, posing as Henry Kissinger. The Pope unfortunately was sleeping at the time, so he wasn’t able to talk to him directly. Draper claims he once successfully prank called President Nixon using his own blue box. Since the mid-1990s, blue boxes no longer work in most countries as phone systems throughout the world have been revamped using a digital system and no longer use the in-band signaling that the blue box exploited. Specifically, the new system separates the voice and signaling channels. As it’s the one year anniversary of Steve Jobs’ death today (dying on October 5, 2011), here’s another great video from Jeremiah Warren, this one on “The History of Steve Jobs”. You’ll also find more Bonus Steve Jobs facts below the video. Steve’s biological parents, Abdulfattah Jandali and Joanne Carole Schieble, met at the University of Wisconsin where Jandali was a professor of political science and Schieble his student. They gave Jobs up for adoption to Paul and Clara Jobs when he was born, supposedly because his biological mother’s family didn’t approve of his biological father. Despite this, in December of 1955, just 10 months after giving Jobs up for adoption, the two got married and had another child, present day bestselling author and professor of English and Literature Mona Simpson (best known for her book Anywhere But Here, which was subsequently made into a movie starring Natalie Portman and Susan Saranden). Jobs didn’t know he had a sister until 1985 when he was 30 years old and contacted his biological mother for the first time. Jobs and Mona became fast friends and remained extremely close throughout his life. Before Jobs’ biological father knew he was the father of Steve Jobs, he managed a Mediterranean restaurant in Silicon Valley Jobs used to frequent. When Jobs’ sister, Mona Simpson, first met her father as an adult (her father and mother had divorced in 1962 when she was just 5 years old and her father did not keep in touch) , he actually mentioned that he had once managed a restaurant frequented by such people as “Steve Jobs… yeah, he was a great tipper.” He didn’t know when he was saying this that Jobs was his son and at that point, Mona chose not to tell him. Mona Simpson has the distinction of having a Simpson’s character named after her, Homer Simpson’s mother. Mona for a time was married to writer and producer Richard Appel, who named the character after her. Before this, Home Simpson’s mother was simply called “Mother Simpson”. When Jobs briefly worked for Atari, he was given the task of trying to reduce the number of chips in the arcade game Breakout as much as possible. The task was a bit over his head, but as he’d done before and would go on to do throughout his life, he demonstrated great business savvy and ability to exploit other people for his own gain by giving the job to his much more technically skilled friend, Wozniak. He offered Wozniak 50% of his earnings from Atari for taking the job. Wozniak then did it, reducing the number of chips by an astounding 50, meaning the total earnings for the job were $5000 ($100 per chip removed was Atari’s offer). They then paid Jobs the agreed upon $5000. Jobs proceeded to give Wozniak $350, stating that Atari had decided to only pay Jobs $700 for the job. Ten years later, when Wozniak learned of this, he wasn’t upset, but said even if Jobs had told him at the time, he’d have been happy to have given Jobs the lion’s share of the earnings even though Woz did all the work, as he knew Jobs needed money at that time and he was a friend. This would set a trend in their relationship, though, Woz doing the work and Jobs taking the credit and the lion’s share of the money. As Wozniak said, “Steve didn’t ever code. He wasn’t an engineer and he didn’t do any original design…” Another friend of Jobs’, Daniel Kottke, said, “Between Woz and Jobs, Woz was the innovator, the inventor. Steve Jobs was the marketing person.” But, to be fair, Jobs was one hell of a marketer and without him, Woz probably would have just had a nice career working at HP his whole life. Jobs even had to work at prying Woz away from HP even as their company grew, simply because Woz loved working there. Despite mostly just taking other people’s ideas and sometimes tweaking, but mostly doing an amazing job at marketing them, Jobs held 342 patents in the United States at the time of his death, usually listed as a co-inventor with the actual inventor. This is something we might call the “Thomas Edison” model. Despite Jobs to a certain extent himself being rejected by his biological parents, he did the same thing for a time to his first child, Lisa Brennan-Jobs. She was born in 1978 to Chris Ann Brennan, an ex-girlfriend of Jobs’, who got pregnant with Lisa when Jobs was dating someone else. Brennan told Jobs Lisa was his, but he refused to acknowledge his daughter, even while Brennan and his daughter were living on Welfare. By the time Lisa was 9, though, Jobs had decided to be her father and from that point on, the two were extremely close. He had three more children, Reed, Erin, and Eve, after marrying Laurene Powell in 1991. Even though he denied that he was the father of Lisa Brennan for a long time, Jobs named the “next generation” computer system he was working on at Apple at the time, “Lisa”. This later became the Apple project the graphical user interface Jobs “borrowed” from Xerox was developed under. Jobs had this type of interface demonstrated to him after being given a tour of Xerox’s Palo Alto facility. It was a system Xerox didn’t think would be popular or practical, but later gave rise to the Apple graphical user interface and Microsoft Windows’ interface. For a while there, Jobs got away with not having a license plate for his car, a Mercedes-Benz SL 55 AMG. In California, you’re allowed to not have a license plate for up to 6 months after you purchase a car. Thus, every six months, he simply leased a new SL 55. He started doing this in 2007. According to Mona Simpson, after Jobs’ liver transplant, Jobs went through 67 nurses before finally finding three he liked and who subsequently were his nurses up to the point he died. Steve Jobs’ teacher in the 4th grade had to resort to bribing him to get him to pay attention and do his homework, giving him candy and money out of her own pocket. He soon became one of the top students in the class, as you might expect. Once he got to middle school at the age of 11, Jobs told his parents, due to bullying, if they didn’t take him to a different school, he would drop out. They agreed and moved to Los Altos, which proved to be huge for Jobs’ future, as without this move, he may well have never met Steve Wozniak. Jobs and Wozniak made their first sale after starting Apple Computers to the owner of a computer store called Byte Shop, Paul Terrel. He ordered 50 computers, priced at $500 each. The computers built to fulfill that order were built in Jobs’ parent’s garage by Jobs, Wozniak, Steve’s sister Patti, and a friend Dan Kottke, with Apple paying Patti and Kottke $1 per board they put together. The retail price for that same computer was set at $666.66 by Jobs and Wozniak, giving them a 33% profit margin. Contrary to popular belief, and even what Jobs himself often said, he was never technically fired from Apple. After the brouhaha between Jobs and John Sculley reached its zenith, Jobs was dismissed by the board, but was still the chairman of the board, just not required, and indeed encouraged, not to come to meetings or show up at work at all. Jobs said about this, “At 30, I was out. And very publicly out. What had been the focus of my entire adult life was gone, and it was devastating. I really didn’t know what to do for a few months. I felt that I had let the previous generation of entrepreneurs down — that I had dropped the baton as it was being passed to me. I met with David Packard and Bob Noyce and tried to apologize for screwing up so badly. I was a very public failure, and I even thought about running away from the Valley.” Jobs then got the idea to try to make high end computers for researchers and universities and came back to Apple to pitch the idea to the board, via starting a new company that Apple would invest in. The board was initially receptive to the idea, until Steve told them who he wanted from Apple for the new company, basically many of the best at Apple. Thus, they rejected his idea, at which point Jobs resigned and sold nearly all his stock in Apple. Again, he resigned, he was not fired. Despite having no product whatsoever other than selling a t-shirt with the company’s logo, and blowing through mountains of money while spinning their wheels, Jobs managed to get Ross Perot to invest $20M in NeXT in exchange for just a 16% share of the company, making the company valued at $125M. This quite possibly was the most expensive start-up t-shirt company in the history of the world, also demonstrating once again how good Jobs was at marketing. At the same time NeXT was failing spectacularly, Jobs’ other company, Pixar, was doing the same. As mentioned in the above video, Pixar had actually started out as a hardware company, selling high end graphics computers, the Pixar Image Computer (PIC), which sold initially for $125,000 per computer, with later editions, the PIC II, selling for $29,500. This endeavor failed, as did many other ventures they tried, such as creating a universal rendering programing language and software package, RenderMan. After Jobs purchased Pixar from George Lucas and the numerous failures that followed, he eventually decided to shut the company down, but continued to be talked out of it by John Lasseter, with Lasseter convincing Jobs that the company could survive doing TV commercials and the like, with the commercials and video shorts being used as a platform to sell the PIC computers. This provided a stay of execution, but even after producing award winning shorts, sales of the PIC computers were still extremely low and Jobs shut down the hardware division of Pixar. Even then, the company lost $8 million dollars in 1990, at which point Jobs fired half the staff and took back all the stock shares that had been given to the employees by shutting the company down and starting a new company with the same name and remaining staff. At this point, Jobs had lost about $50 million on Pixar. Pixar’s fortunes changed thanks to John Lasseter, his team, and their development of the script for Toy Story, which was initially rejected, but after significant modifications, accepted by Disney’s Jeffrey Katzenberg. Before Katzenberg accepted the script for Toy Story, Jobs had been very close to a deal to sell Pixar to Microsoft. Steve Jobs was listed as an executive producer of Toy Story, the movie that finally made Pixar a viable company and allowed Steve Jobs to once again own a profitable business, unlike what Pixar had been and what NeXT was up to that point, both money-sinks. Thanks to Toy Story, when Steve Jobs took Pixar public, it became the biggest initial public offering in 1995, even bigger than Netscape. As the sole owner of Pixar, as he’d taken all his employees shares, Jobs was now for the first time a billionaire, with a net worth of about $1.5 billion. Mona Simpson states that Steve Jobs’ last words, after looking at his sister, his wife of 20 years, and then his children, then staring off into space, were “Oh wow. Oh wow. Oh wow.” At which point he fell asleep and died shortly thereafter. Excellent article, but one minor nitpick in the Bonus Facts. The fictional Mona Simpson was Homer Simpson’s mother, not Marge’s. Yes, as usual Wozniack had the brains and talent and Jobs just wanted to make money. Seems silly that yr bonus facts section is longer than the actual article. Seems that Jobs was more of a good crook – almost all of his “successes” were built by being dishonest in some way, shape, or form (blue box, the fee he paid Woz for the Atari chips, Xerox, and so on.) Just seems funny that Apple would sue MicroSoft for stealing ideas for Windows when they did the same thing, over and over.